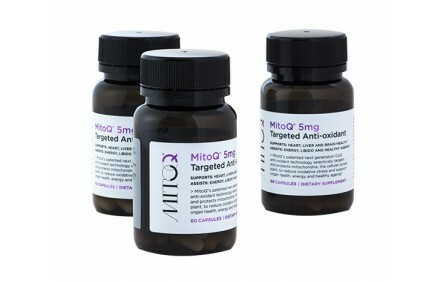 A new supplement that has recently emerged to help alleviate common symptoms of MS is MitoQ. Although not specifically made for treating MS, MitoQ has been a popular supplement for people with MS. It helps reduce fatigue, improve brain function, and decrease muscle tiredness, which are all common symptoms and side effects of MS. I have had great success while on MitoQ for the past year so I wanted to share my results with the MS Community. Below is my review and other reviews on MitoQ and how to buy. Hi guys, I'm Daryl Bryant, author of MS Living Symptom Free, and today I wanted to share with you on my review on MitoQ. But before I get into that I just wanted to let you know that just like you, I am an MS patient whose life has run the gamut of emotion and depression and pain when it comes to living with Multiple Sclerosis. So many years ago I started to change my life and live a healthier life, which allowed me to really focus on diet and how different foods, vitamins and supplements can play a key role into your overall health with MS, helping to manage the symptoms. 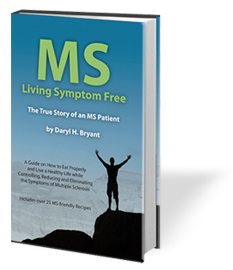 Over those years I found a path that worked for me so I wrote a book called MS Living Symptom Free. When I originally wrote the book I said, "If I can help at least just one person to try to find a new path to help them along their journey," I said, "It would be all worth the effort to write the book," but you know over the last four years I've sold thousands of these books and I'm just really taken back by all the people reaching out and letting me know of how they look to my book to help them manage their MS and their symptoms and it's just making me so happy. Just so you know, all the proceeds that I get from the book I put back into raising more awareness. I market on Facebook. I create different campaigns and promotions and really try to spread more awareness to help people with MS to live a healthier and happier life. That's why I do everything that I do. You know, I found something that works for me and I just want to share that with the world. My Facebook page is approaching a hundred thousand fans and I just love to see that and love to help more people. So when I came across MitoQ about a year ago, probably very similar to many out there, I was skeptical [00:02:00] that they were saying that this could help people with MS to improve energy, help with cognitive function, and the list goes on. I started to do some research, I read through the reports and I started to uncover that there is some real truth behind this. Originally this MitoQ is an anti-aging supplement. They have a serum too, and it supports to mitochondria on a molecular level down to the cells and it helps support overall organ function and through this they found that it's helping people with auto-immune diseases and MS. So, I decided to purchase. At first it seemed very costly. Some of the prices are very high, but then when I broke it out into a monthly basis it wasn't that horrible. Then when I started to look at the price of my health, it was truly priceless and I said, "You know, if there's a supplement out there that's going to help me with my MS, then I think it's worth it." So I purchased and started taking it. Within the first month, I noticed an improvement in energy. I was less foggy in the brain and was able to get through the day without being so tired. It also helped with my cognitive function and was a little bit clearer, a little bit crisper with my thinking. I definitely contribute all of this to the MitoQ. I reached out to two of my friends and they also purchased it for themselves, they have MS, and they too had very similar experiences and they definitely related it back to the MitoQ. Now I'm seeing some videos coming out from the company and there's people that were in wheelchairs that it's now helping with their mobility and helping them to walk. I really believe in the company and what they're doing. [00:04:00] Because of the voice that I have out there in the community, I reached out to the CEO of MitoQ. I started talking to Greg Macpherson, who is such a great guy and is so passionate about helping the community. He really believes in his product, as do I. He loves what I'm doing and because of everything that I do, he was able to share a coupon code to help my fans to save some money when they buy it if they figure out that its right for them. It's a code that you'll find online and is exclusive for my fans. You can find out about it on my website or through the Facebook page. So that's my review on MitoQ. If you figure out, you do some more research and you find it's for you, I really hope that you experience the same benefits that I have. If you're looking for something to give a try, I definitely believe in it and again, hope you experience the same that I have. So thank you for listening and please be well. MitoQ is an emerging antioxidant that successfully reduces the symptoms and helps to manage the side effects of Multiple Sclerosis by targeting mitochondria. It has been selected by the internationally renowned USA's National Institute of Aging's Interventions Program for showing significant potential in "delaying or decelerating the aging process and improving generaly health." Originally used to combat other neurological disorders, including Alzheimer’s and Parkinson’s, research studying the supplement's effect on MS began in early 2013. Scientists tested the MitoQ on groups of mice infected with autoimmune disorders. By the end of the study, the two groups given MitoQ survived, with the group of mice pre-treated with MitoQ yielding the best results. Based on these results, more animal testing was done before human trials began. However, after the successful treatment rates in the human trials, MitoQ became available in December 2013 and MitoQ is more powerful than CoQ10. Because MitoQ specifically targets the mitochondria, the dietary supplement works by providing the body with antioxidants to rebuild the damaged neurons and nerves caused by the inflammation unique to MS. In a healthy body, mitochondria regulate cell energy, metabolism, and growth in the brain, heart, and liver, but in the bodies of those suffering from neurological diseases, the mitochondria prematurely attacks the brain and breaks down cells, releasing waste into the bloodstream and causing further inflammation of the damaged areas. When you take MitoQ, the antioxidants in the supplement work almost immediately. They adjust the behavior of the mitochondria and repair the inflamed areas of the brain. By taking MitoQ regularly, the antioxidants and mitochondria will work together to strengthen your immune system, giving your body more of a chance to combat the disease and the symptoms on its own.to MS. In a healthy body, mitochondria regulate cell energy, metabolism, and growth in the brain, heart, and liver, but in the bodies of those suffering from neurological diseases, the mitochondria prematurely attacks the brain and breaks down cells, releasing waste into the bloodstream and causing further inflammation. What are the benefits of taking MitoQ? What are people with MS saying about MitoQ? And last, but certainly not least, watch this amazing video on Fraser and how he has beaten fatique that's associated with his MS, due to taking MitoQ. Amazing review! I am grateful to be able to bring valuable content and information free of charge for the MS community. In order to contine in this persuit of providing free content and resources, you should assume that any links leading you to products or services are affiliate links that will provide compensation from your purchase. I only recommend those products or services that I truly feel deliver value to you as a fellow MS patient, such as MitoQ. I use the sales from my book and other commissions received to provide more awareness for the MS community so I can continue to afford to spread the word and help other people who are affected by MS.